The scene outside of New York City Hall in late May was several years in the making. Dozens of taxi and livery drivers from across the city had joined together outside the ornate structure to call for immediate action to a growing crisis. A fifth driver in the city had committed suicide in recent days, a devastating byproduct of what friends and family attributed to an overwhelming debt load that he couldn’t handle once ride-hailing services like Uber and Lyft arrived in New York. More and more drivers started competing for fares, struggling to net a livable wage. It’s a trend that has only accelerated over time, a trend that the city had a chance to prevent. At least it did, once. When Uber launched in New York in 2011, the company described its vision as a win-win for everyone. “Uber brings the convenience of a yellow cab, the quality of a luxury limo, and adds an Uber cherry on top—on-demand mobile requests,” the company said. The rosy pitch hasn’t played out. Instead, the city got even more traffic congestion, not convenience. The number of for-hire vehicles on city streets has exploded to 130,000 from 50,000. The business model for ride-hailing apps necessitates a flood of drivers to ensure riders can order up a car with ease, so congestion and competition have swelled in tandem. Today, roughly 35 percent of miles driven by Ubers and Lyfts in the city today are without any passengers, just roving the city looking for fares at any given time. And for traditional cab and livery drivers, that outcome has been nothing short of chaos—longer days, less fares, a mental and physical strain to simply survive. This was the other promise of Uber: that it would make part-time work easily accessible to anyone with a car just wasting time in their garage. Everyone would be more efficient, more flexible, more profitable. But instead of promised gig-economy flexibility, all New York City has seen is more and more people driven into debt to drive, and more traffic. Policy proposals are on the table, most recently being a minimum wage for all drivers in the city or a possible cap on ride-hailing cars for a year, yet there seems to be little agreement among the companies, drivers, and policymakers, on which is the correct path forward. Uber and Lyft rebuff many of the complaints levied their way, and have pointed to cab drivers not providing coverage in the past for outer boroughs of the city as justification for their unfettered existence. They’re providing a service to those who weren’t covered by traditional cab drivers, the companies argue. The companies have aggressively ramped up a doom-and-gloom public relations effort to counter the proposed cap on cars for a year, which is scheduled for a vote before New York city’s council on Wednesday. But after a sixth driver committed suicide last month, it’s obvious the status quo can’t be preserved. Richard Chow said as much at the rally in late May. The body of Chow’s brother, Yu Mein, was discovered earlier that month in the East River, after he’d been missing for nearly two weeks. Yu Mein, known among cabbies as Kenny, had been unable to grapple with the debt he’d taken on to drive in the city, his brother said. It wasn’t always that way. Richard Chow said he came to New York in 1987 with his brother and their family on a plane from Burma. They saw opportunity in the city, and after a career as a jewelry maker, Chow said his brother opted to drive full-time. He took out a $700,000 loan, Chow said, to buy a taxi medallion, which are sold by the city and give drivers the legal right to operate a cab. But once Uber and Lyft came to town, things went downhill. Medallions are how the city could regulate the number of cabs on the road, trying to keep the job and traffic sustainable. Once financed to be a nest egg much like a mortgage—after being paid off they could be sold to other drivers—their value has plummeted in recent years, leaving drivers in the lurch. “He was working very hard,” Chow said of his brother. “He owed a lot of money.” By the time he died, the loan still carried a $580,000 balance. Between his home mortgage, gas, electricity, phone bill, tuition, it all added up quickly. Chow pinned blame on the proliferation of ride-hailing drivers. By one estimate, 3,000 new drivers hit the streets every month. What’s curious about the current environment is that it’s nothing new for NYC. Nearly a century ago, the city was consumed by cab drivers. “Chaos reigned in the streets in the early 1920s,” wrote Graham Russell Gao Hodges, a history professor at Colgate University and a former NYC cab driver and, in his book, Taxi!, which focuses on the city’s history with taxi drivers. The scenario he describes mirrors the situation today, where Uber and Lyft use venture capital funding to artificially suppress the price of fares in an effort to capture market share. “All sides agreed that the root problem was the overabundance of cabs and drivers,” he continued. The medallion initially cost drivers $10 to secure one, but after World War II, NYC grew into the city it was and has been for decades now. The medallions took on value, and cab driving as an occupation improved “dramatically,” Hodges said in an interview. “It doesn’t go sky high until much, much later,” he said. The main reason for the change happened in 1979, when the city’s Taxi and Limousine Commission tweaked the medallion system and allowed medallions to be leased out for the first time for up to 12-hour shifts. Before then, most drivers worked on commission, if they didn’t already own a cab. But the outcome of the change transformed the majority of cab drivers into independent contractors under federal labor laws. Fleet owners started purchasing swaths of medallions as they came up for sale, and while drivers could still make a living, they now had to pay for things like insurance and fuel, Hodges said. For those who could get a medallion of their own, or even split it with a sibling, it was still something of an opportunity thanks to its hefty cost. Lucius Riccio, lecturer at Columbia’s School of International and Public Affairs and former city transportation commissioner, told Jalopnik that drivers bought into the idea as a sort of scheme to eventually retire. “Buy a medallion, leverage it like a house, and when it matured it would provide a healthy retirement for a hardworking person,” Riccio said. Even with the 1979 Taxi and Limousine Commission changes, Hodges agreed, drivers still had a chance to produce a decent living for their family. It was tight, but it was doable. Within a couple years of arriving in NYC, drivers already limited with their financial resources had to start competing with a massive fleet of part- and full-time drivers who shacked up with the ride-hailing giant. And they came in fast. The business model of Uber (and later Lyft) meant letting any person who met its qualifications pick up and ferry passengers in their own car. All Uber and later Lyft drivers needed was a TLC license to launch. Uber and Lyft portrayed themselves as different from traditional taxis, that all the apps did was “create driver jobs,” said Riccio, the Columbia lecturer. And with the competition of so many ride-hailing cars on the road—plus the fact that Uber and Lyft drivers are contractors without benefits—app drivers hustle around the clock to make ends meet, and the goal of retiring with proceeds from the job is all but unattainable. The city put forward legislation in 2015 that would’ve limited for-hire licenses based on a so-called company “base” size, reported The New York Times. It would’ve limited any base with more than 500 vehicles to 1 percent growth. In NYC, Uber operated seven of the 10 bases, and it’d been growing roughly 3 percent per month at the time. The company pushed back vehemently. In one example, Uber developed a specialized feature for NYC users called “de Blasio’s Uber,” which showcased 25-minute wait times, if there was even a car available at all. Within days, in a stunning reversal, de Blasio relented and dropped the cap proposal. The city reached an agreement with Uber to conduct a four-month study on the effect of Uber and for-hire vehicle operators had on NYC traffic. This is how Uber fought. And the aggressive PR campaign Uber mounted won out. Uber drivers and their supporters protest in front of the offices of the Taxi and Limousine Commission in New York, Thursday, May 28, 2015. When the 12-page report was quietly issued early 2016, the city recommended against enacting a cap, asserting that the increase in trips from ride-hailing companies had been offset by a decrease in trips from yellow taxis, the Times reported. The result of congestion supposedly had nothing to do with the tens of thousands of cars that took to the streets to drive for Uber; it was everything but ride-hailing services. Analysts derided the study as “flimsy,” and other researchers have repeatedly found since then that ride-hailing services have vastly inflated congestion in the city and elsewhere. Then, at the beginning of this year, the reports of drivers killing themselves over financial instability started to emerge. There was Douglas Schifter, a black car driver who shot himself with a shotgun in front of City Hall after writing on Facebook that NYC’s decision to give Uber free rein in the city ruined his life. De Blasio, inadvertently or not, responded with a callous remark that captured just how far removed the city government was from the situation. “Let’s face it, for someone to commit suicide there’s an underlying mental health challenge,” he said. The mayor has since revamped his messaging and says action is sorely needed. Still, the death toll has continued to climb. Nicano Ochisor, a yellow taxi owner-driver who split driving duties with his wife, hanged himself in his Queens garage. And weeks after Kenny Chow’s body was discovered, Abdul Saleh, a Yemeni immigrant who worked as a yellow cab lease driver, was found dead in his Brooklyn apartment, making him at least the sixth financially struggling driver to commit suicide since November. Desai and her group started ratcheting up efforts to call attention to the rash of deaths. And a number of recent studies have backed up what she and her cohorts were saying when Uber prevailed in the 2015 fight over a proposed cap: NYC is getting clogged up with more and more ride-hailing vehicles. A recent study by Bruce Schaller, a former deputy commissioner for traffic and planning at the New York City Department of Transportation, found that ride-hailing trips increased 72 percent between 2016 and 2017. Uber’s lower-cost UberX option adds 2.8 new vehicles miles for each mile of personal driving they eliminate. Even the pooled rider options like UberPool and Lyft Line increase congestion, Schaller said. Uber and Lyft countered Schaller’s assessment, with Uber arguing that the company reduced total miles driven by shifting drivers into the pooled service. But Schaller didn’t focus on efficiency, and at the same time pointed to the growth of pool services as being unsustainable for cities. Another recent study commissioned by NYC’s Taxi and Limousine Commission highlighted just how strained drivers in the city have become ever since Uber first deployed in the city in 2013. The report’s authors, James Parrot of NYC’s New School and Michael Reich, professor at the University of California-Berkeley, found that 90 percent of the city’s app-based drivers are immigrants. For two-thirds of them, driving is their only profession. The whole “side gig” fantasy of those early days of Uber and Lyft was just that: a fantasy and not much else. “Eighty percent acquired their vehicle to enter the industry and would risk losing their investment if they switched to working in another industry,” the study said. Today, the authors found, 40 percent of drivers have income so low they qualify for Medicaid. An estimated 16 percent have no health insurance. Nearly one-in-five qualify for food stamps. “That’s enough to convince you right there that something’s wrong,” he added. NYC’s unlike most major cities, and with more than 8.5 million residents calling it home, regulation for an industry like driving is a necessity, said Columbia’s Riccio. Policymakers are busily crafting proposals to address the issue, but that’s not to say everyone agrees on a path forward. In one example, state lawmakers crafted a budget that was passed earlier this year and implemented a new fee on taxis and ride-hailing services operating south of 96th Street in Manhattan, the area that covers just about everything wealthy, touristy, or both. For ride-hailing services, it’s $2.75 per ride; for taxis it’s $2.50 The fee is expected to raise an estimated $415 million for subway repairs, and stands as the first phase of a plan to impose tolls on all vehicles, reports The Associated Press, an idea known as congestion pricing. The NY Taxi Workers Alliance slammed the measure, and taxi drivers warned the fee, which goes into effect Jan. 1, is akin to throwing salt on an already gaping wound. “We don’t want to be part of the problem,” Khosrowshahi told the New York Post. Desai, of the Taxi Workers Alliance, decried it as a public relations stunt. The alliance and the guild, which is affiliated with the International Association of Machinists and Aerospace Workers, are frequently at odds with one another, according to The New York Times. That’s evident in yet another discussion about a proposed minimum wage of $17.22 per hour for ride-hailing drivers in the city, in which drivers would earn an additional $6,345 per year. The minimum wage would be the first of its kind in the U.S. But Desai, of the Taxi Workers Alliance, said the study doesn’t consider the impact of growing income inequality by locking drivers into a minimum wage instead of a fare for a ride. Instead, Desai argued, city officials should throw their weight behind a proposal much less cozy for Uber and Lyft’s flood-the-streets system: cap for-hire vehicles, and ensure that drivers can earn income based on the rates of the fare. The proposed cap legislation would be the first of its kind in the U.S. and halt the issuance of new for-hire vehicles until a yearlong study on the industry is completed by the city. Uber and Lyft immediately responded, with the former launching a social media campaign and putting up a new ad showing what it claims will happen if the cap is imposed. The upshot: Wait times would increase and Uber cars would dry up. All told, New York City has boiled into a brimming indictment of the gig economy and the modern era of smartphone taxi-hailing. An already taxing job has been made more difficult—fatally difficult—for drivers, all in the name of not getting in the way of a new technology that has only ever made its executives wealthy and failed to realize its populist fantasies. Hodges, the Colgate professor, knows firsthand how difficult driving can be day in and day out. After five years, he said it left him feeling broken. “I found myself turning in earlier, earning less, just because driving 150-160 miles a day on city streets for 12 hours is really, really tiring,” he said. 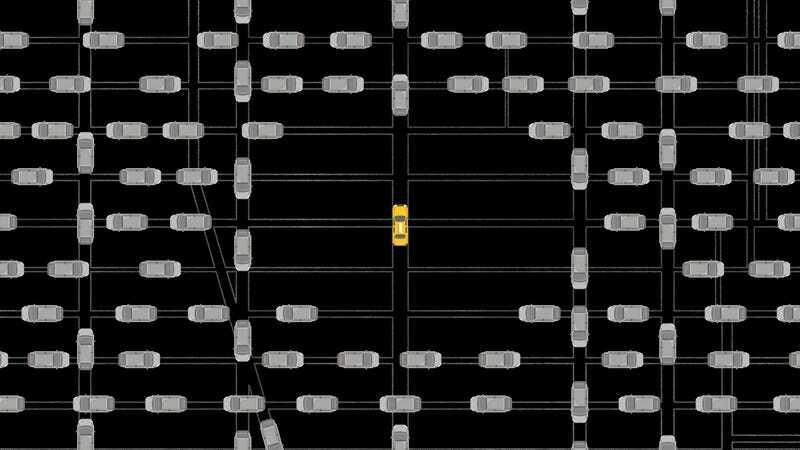 NYC’s drivers somehow made it all work for decades, until Uber and Lyft arrived, and city officials let the ride-hailing services roam freely. The net result? An already bruising job for drivers became financially inviable, right in the heart of cab driving in America. With that in mind, Hodges said that New York illustrates why workers need protection and to have the support to sustain a livable wage. Under the gig economy model, which leans more than heavily on the efforts of part-time drivers, that can’t be achieved if some only head out when they have a spare hour or two to ferry passengers. Desai said policymakers waited too long and need to take immediate action.